Every month, every department in the store offers items on sale, including many local and organic products. 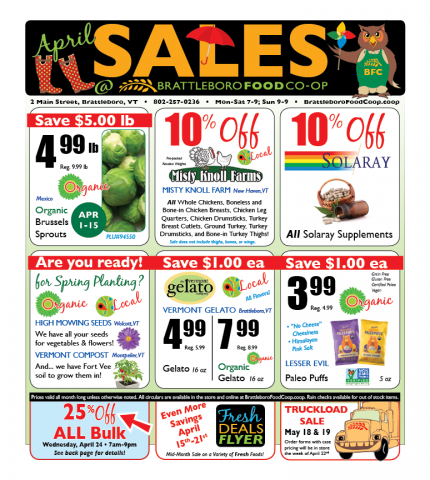 Our monthly sale flyer is distributed via the Food For Thought Newsletter (as a centerfold insertion). The monthly circular is also available at the Co-op. Shopping the Co-op sales flyer is a great way to try new products, eat well, and save money. Join us to sample the wine on sale the second Thursday of each month, and many items are available for tasting throughout the month. Watch the monthly calendar for dates and times.